Few dishes give us so much bang for our buck, as the richly meaty sauce combines with the acidity of the tomato, the sweetness of the vegetable soffrito, the slippery pasta and the snowfall of grated cheese. This makes a lot of sauce, so set some aside to freeze for another meal. 1. Heat two tablespoons oil in a large heavy frypan. Add bacon, onions, celery and carrots and fry, stirring, for 10 minutes until softened. Tip into a bowl and set aside. 2. Add remaining one tablespoon olive oil to the pan and fry the beef and garlic until browned. Scatter with flour, then stir it through and cook for one minute, stirring. Add wine, bring to the boil and boil for three minutes, stirring. 3. Return the vegetables to the pan, and add tomatoes, tomato paste, sugar, anchovies, bay leaves, thyme, oregano, nutmeg, sea salt and pepper and stock or water, and bring to the boil. 4. Reduce to a simmer, cover and simmer for two hours, stirring every 20 minutes, until the sauce is rich, thick and glossy. 5. Cook the pasta in plenty of salted boiling water until al dente and drain. Toss with sauce and serve in warm pasta plates. Top with parsley and butter, and serve with parmigiano for grating. 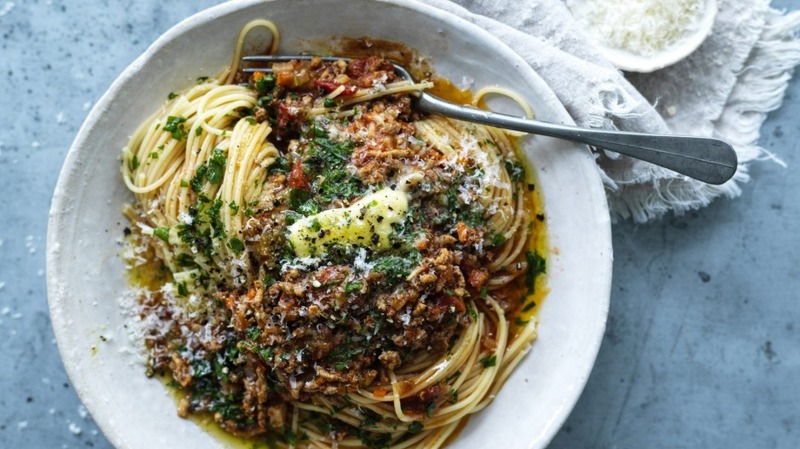 Or try Jill's mushroom and lentil bolognese as a meat-free alternative. Find more of Jill Dupleix's recipes in the Good Food Favourite Recipes cookbook.